It would be hard to find any worldly place where the sand runs smoother and the ocean shines brighter than the heavenly island of Mauritius. Mauritius is a beautiful, tropical island set in the Indian Ocean, an ideal holiday destination; a luxury paradise unlike any other. An intriguing mix of French, African and Indian cultures, this small paradise has developed its own alluring ambience that has been enticing discerning travelers to its tropical shores for many a year. Mauritius is a true paradise island where the world beneath the water is just as spectacular as the one above. Tropical palms and turquoise lagoons dominate the scenery in this part of the Indian Ocean, where the Mauritius shoreline stretches for 300 kilometers of uninterrupted beauty. It offers unspoiled coral reefs and beautiful clear lakes with a large choice of small island destinations, such as Coin de Mire, Flat Island, Gabriel Island, L' Ile aux Cerfs and Ile aux Beniters, some of the best snorkeling sites in the world can be found between these islands. Sunbathing delights abound on the beach pleasures of Belle Mare, Flic-en-Flac, Le Morne and Pereybere, while Grand Baie and Blue Bay are the perfect water sport locations. A yacht is a recreational boat or ship. The term originated from the Dutch Jacht meaning "hunt". It was originally defined as a light fast sailing vessel used by the Dutch navy to pursue pirates and other transgressors around and into the shallow waters of the Low Countries. After its selection by Charles II of England as the vessel to carry him to Britain from Holland for his restoration in 1660, it came to be used to mean a vessel used to convey important persons. In modern use the term designates two rather different classes of watercraft, sailing and power boats. Some very large vessels have been built entirely for private pleasure and pleasure-charter use. The yachts themselves are as diverse in their wonderful style and characteristics. Yachts are atypical from working ships mainly by their leisure purpose. Yacht lengths generally are in the range from 20 feet (6 m) up to hundreds of feet. A mega yacht generally refers to any yacht above 100 ft (34 m) and a super yacht generally refers to any yacht over 200 ft (70 m). Nowadays, one model which is becoming more and more popular is the Luxury Yacht. Available in a vast array of sizes, styles and functions, there is a luxury charter yacht to suit every need. As a client, you can bring aboard all you like, though you will find almost everything already taken care of. With superbly decorated, spacious cabins, first-class services and range of interesting activities, crewed super yachts will make sure to have all your vacation needs covered. Choose the world’s most beautiful destinations and get ready to spend a vacation in opulence, style and comfort and indulge yourself by renting a luxury yacht. Mauritius is a tropical pearl located in the warm turquoise water of the Indian Ocean and sailing through the coast of this paradise island is a delightful experience. The yacht men all over the world come to spend their sailing holidays and enjoy the crystal clear waters, beautiful sandy beaches, indigenous marine creatures, tropical plant and wildlife full of colors and unimaginable beauty and company of friendly and cordial Mauritian inhabitants. The island is ringed by coral reef which makes it marvelous for snorkeling and water sports. Mauritius offers a wide range of sailing activities on various types of cruising vessels to take you for unforgettable sailing trips to one of the hundred small islands surrounding Mauritius' main island. 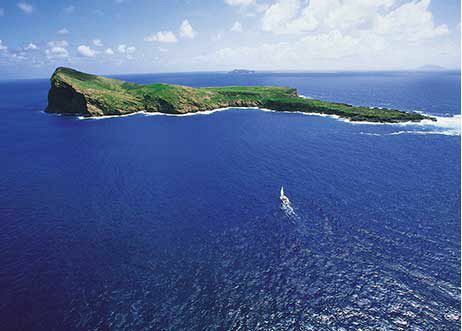 Sailing around Mauritius is possible all year-round; which is another reason why this sailing destination is so popular. So get ready to enjoy the beauties of Mauritius on skippered yacht charter! We have varied types and sizes of yachts in Mauritius. Yachts in our paradise island can also be considered as catamaran boats, luxury yachts and more are available to take you on a sailing trip, cruise or to enjoy some of the sea excursions in Mauritius, safe and sound. Also known as a Super Yacht, a luxury yacht may be either a sailing or motor yacht. These yachts are equipped with navigational devices, safety equipments and various other facilities to make cruising comfortable and enjoyable. The yacht allows comfortable areas for discovering our underwater treasure owing to some snorkeling. You will benefit also to please the eyes on admiring the calm turquoise waters set in the backdrop of mountains and lush green forests, Mauritius is every travelers dream destination. In Mauritius, the most popular yacht is the catamaran owing to its high degree of comfort, convenience and stability that will please both sailing amateurs and those who just want to enjoy a cruise experience. The catamaran cruise sails in the shallow drafts and proximity to the water that make them perfect for swimming and discovering the coral reefs. For exploring the Mauritius coastlines, there is no more luxurious or prestigious alternative. Also, without any doubt, luxury yacht are exploring their way in our paradise island while sailing in the tropical palms and turquoise seas that really dominate the view in this part of the Indian Ocean, where the Mauritius shorelines stretches of an flawless beauty. For all people who are sea lovers, we can blindly dedicate the Indian Ocean which offers unspoiled, eye-catching beauty which is best appreciated from the comfort of a luxury yacht. Catamarans with all the comforts and luxuries are an excellent choice for a yacht charter. Mauritius Attractions offers a wide range of yacht charters on various types of cruising vessels to take you for unforgettable sailing trips to one of the small islands surrounding Mauritius' main island. We can offer them in either shared crewed basis or private; it highly depends on your preferences. For a peaceful day at sea, we recommend the day-chartering of yachts on an exclusive basis. The rentals include the services of crew, the organization of food and drinks and more. With Mauritius Attractions, one of the greatest advantages of chartering a super yacht is the constant contact with the sea, the constant access to an aquatic playground of limitless possibilities. Whether it be snorkeling or diving in the spectacular world below the water, or exciting water sports and beach pursuits in the sun above, a super yacht makes for the perfect platform for holidays in Mauritius. Enjoy a day cruise on-board the most luxurious catamaran currently operating in Mauritius. The unique catamaran Luxury Lagoon 500 catamaran was built by special request in France in 2011, available for freight in Mauritius. It is often used by VIP clients for either day charters or overnight cruises. The boat is like a top class hotel, offering all the possible facilities and features as well as has 4 luxury cabins. It is fully air-conditioned and you are sure to benefit from various amenities such as water-maker, ice-maker, TV, DVD, Hi-Fi sounds system with selection of CDs, 4luxury cabins, each with en-suite bathroom. Exclusivity and Privacy - You and your guests will be the only aboard and are guaranteed exclusively and privacy with friendly attendant professionals who will cater for your every need personally. Unique dining experience - Exquisite menus are prepared to your liking accompanied by the world’s finest beverages, all served on board whenever and wherever you choose. Each meal is personally prepared for you by a qualified personal chef from a choice of fine dining menus. 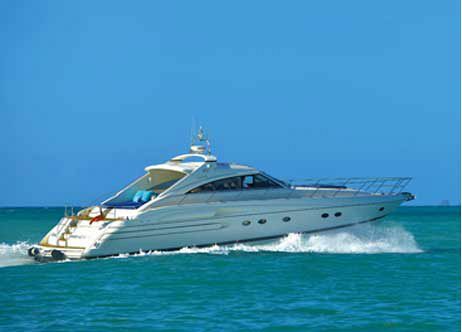 Enjoy a discreet luxury cruise on board this fabulous power yacht with exhilarating performance! This yacht cruise is all about personal service, attention to details and true luxury. As part of this day cruise you will visit the Northern Islands of Mauritius, Coin De Mire, Flat Island and Gabriel Island, to spend the day on-board the yacht and on any of these islands. Having vast experience in the Yacht charter market and an instinctive understanding of the customers every wish, we planned this yacht day cruise providing an unsurpassed taste of elegance and style. Whether you seek palm-fringed beaches, relaxing on board, or snorkeling in sparkling blue waters we will make sure to tailor-made this yacht cruise according to your wishes and desires making sure you will have an extraordinary experience of pure luxury and fun. From the salon to the aft deck, and up to the fly-bridge, the yacht allows comfortable areas for sun bathing, snorkeling, swimming and just relaxing. The salon offering comfortable air conditioned lounging for reading, videos or socializing. Enjoy a discreet luxury cruise on board this fabulous power yacht with exhilarating performance discovering the dolphins at the south west of Mauritius. This yacht cruise is all about personal service, attention to details and true luxury. 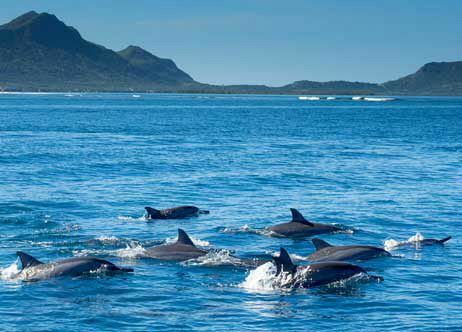 The yacht will then depart from Grand Baie , cruising along the entire west coast of Mauritius reaching Tamarin Bay for encountering the dolphins. Treat yourself and your loved ones with a 3 hour evening cruise along the clear waters of the Mauritius. Watch the ocean all around you and feast on a Mauritian luxurious fine dining dinner. This will be a memorable night on board a unique luxurious motor-boat yacht. Every evening the boat sets sail on a superb gastronomic cruise around Grand bay coastline. The boat cruises slowly and provides a truly romantic atmosphere. The boat sails along the coasts of the bay, cruising along the calm waters of the lagoon, until it reaches a strategic point in the middle of the bay where you will enjoy a 360 degrees view of Grand Bay and its surrounding. The sight of Grand Bay and all the hotels situated along the bay during the night time is remarkable. Built in 1929 at the Taylor & Smith shipyard, the boat served for many years for transporting Mauritius’ most important personalities of that period. During recent years, this 19 tones ship, made in the highest quality of teak wood, has been fully restored to its former glory days using the finest materials and with much skill.